Learn what yoga is, its healing benefits, about different systems, about yogic spiritual practice, tips on starting your exercise practice, and a simple five minute routine to increase energy. 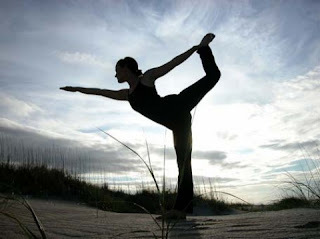 Yoga is done through a series of flowing postures called asana’s. Asana’s help train your body by developing control over your limbs and developing control over your limbs and developing muscle flexibility and elasticity. The asana’s incorporate controlled breathing techniques, or pranayama which is used to channel prana (Universal Life Energy) throughout the body. Complete concentration o the flowing body postures and breathing make yoga a powerful moving meditation facilitating health and wholeness and spiritual well being. Yogic practice consists of five key elements: proper breathing, proper exercise, proper relaxation, proper thinking, and meditation. Simply put, a “yogini”, one who practices yoga, must be mindful to apply what they learned on a day-to-day basis. Yogic practice is not just movement on a mat. It is a spiritual attitude that is to be put in practice minute-by-minute, hour-by-hour, day-by-day. “What we westerners call spinal alignment, yoga accomplishes through various poses or exercises designed to do what some of us pay chiropractors to do.” Page 6, The Complete Idiot's Guide to Yoga by Joan Budilovsky and Eve Adamson. Yoga is healing power. It is a common belief of many holistic health parishioners that an aligned spine enables the body to function more efficiently. Yogic practice stretches, loosens, and aligns the spine allowing pranic energy to flow freely through your spine and entire body. This energy flow enhances circulation, digestion, respiration, posture, tones the organs, and cleanses and detoxifies the body as a whole. There are several yogic styles to choose from depending on your needs, physical ability, and of course, preference. Listed below is just a sample of some of the classical and hybrid systems of yoga. It is said that the different styles of yogic practice are all like the rays of one sun; they all come from the same source. I define Hatha as the all person, all friendly yogic practise. The Sanskrit definition for “hatha” is sun (ha) and moon (tha) signifying the union of opposites. This style is what many people associate yoga to. Pantanjali, the father of yoga, taught that the most common way to unite body, mind, and spirit is through asana’s, or postures. Hatha utilizes the body to change the inner mind and consciousness, teaches coordinated breathing techniques, and meditation. One of the largest yogic schools, Sivananda combines a balanced format of asanas (body postures), pranayama (breathing techniques), meditation, and suggested practices for healthy living. Sivananda’s motto is “simple living and high thinking”. This popular yogic hybrid is named after its creator, B.K.S. Iyengar. Iyengar focuses on precise alignment and helps to meet an individuals needs through yogic props such as belts, straps, wooden blocks, and folded blankets. This yogic style found its roots in the Iyengar style and also concentrates on the proper alignment of the physical body. However, Anusana was developed to connect the mind, body, and spirit with respect to their equality. This is a relatively new yogic hybrid developed by Joan Friend in 1997. Anusana is a Sanskrit word that means “flowing from the heart” or “to step into the current of Divine Will.” The central philosophy of Anusana is expressed in three principles: attitude, alignment, and action. The current trend called power yoga is based on this physically demanding yogic style. Developed by K. Pattabh Jois, Ashtanga builds strength, stamina, and flexibility by jumping from posture to posture through a series of flowing asanas. This is an advanced workout for the serious Yogini who is not afraid to sweat. Kripalu was compiled from the teachings of Swami Kripalu and is a physically adaptable yogic style which emphasizes proper breathing, proper alignment, coordination of breath and movement, and the respect of the body’s own physical limitations. The word “Kripal” in Sanskrit means “compassion”. Kripalu has three stages: the practice of postures and breath awareness, the practice of holding postures in order to develop inner awareness, and the third stage is learning to move from posture to posture from an inner place of peace and meditation. “The easiest way to understand kundalini is to acknowledge that there is a Universal Spirit, sometimes referred to as God. God unfolds him/her/itself. This uncoiling process is known as kundalini. What is uncoiling and awakening is you, nothing more and nothing less. It is a normal process that most people are simply not utilizing.” P. 184, KISS Guide to Yoga , by Shakta Kaur Khalsa. Kundalini Yoga was brought to the west in the late 1960’s. The practice consists of classic asana’s (poses), breath, meditation, and coordination of breath and movement. Its goal is to unlock and release kundalini energy up the spine and through the chakras. Created by the son of Sri T. Krishnamacharya (also known as “The Grandfather” of the Iyenvar, Viniyoga, and Ashtanga practices), Viniyoga is suited for the individual. Its basic teachings are classic asana practice combined with the integration of breath with the movement of the spine, pranamaya, mantra, and meditation, brought together with respect to each individual’s physical uniqueness. Translated from Sanskrit “Vini” means “individual” or “special”. It is a perfect yogic practice for beginners and for persons with limited flexibility or specific physical limitations. I believe that the Sun Salutation, a series of flowing asanas used as a warm-up in most classical yoga styles, is one of yoga’s best kept “secrets”. The Sun Salutation is a twelve part warm up used to limber the body and mind prior to a yoga session. Each of the twelve positions brings a different vertebral movement to the spinal column and is attuned to inhalation and exhalation of the breath. It is usually suggested that a practitioner perform six sequences at the start of every yogic session. The Sun Salutation is an excellent self-sufficient routine that can be used when a full yogic routine is not possible. Additional Yogic Resources click here . . .